Blogs from the bank: Carp and Coarse fishing: Cool for Cats! On the bank is a facebook group I set up to share this blog, discuss all things angling related and to be a hub where other bloggers can promote their posts. Naturally I invited my friends to join and some writers of blogs I enjoy reading and gradually momentum is gathering and is fast becoming a great resource for advice. It wasn't long however before the idea of a social gathering was suggested and a few of us were making arrangements to meet for a 24hr session at Charlie's Lake, Ashford. 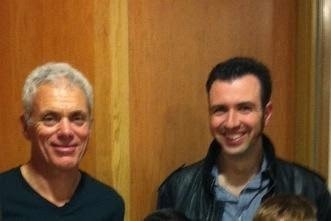 Jeremy Wade and a very happy fan! This water holds some big carp but is notorious for its stock of wels catfish. These are not a species I have ever targeted before but have been discussing and researching for a while. In the days before this trip many hours sleep were lost through sheer excitement about the prospect of catching my first cat. Only a few weeks ago I had the pleasure of meeting Jeremy Wade, on his 'River Monsters' tour, whose tales of big catfish caught in exotic locations only added fuel to the fire! On arriving at the lake I saw my friend Robin, who was just packing up having caught over 400lbs of cats in one session. I later came to realise the importance of location and it would seem this is something Robin must have got spot on. Setting up next to Stuart, who had already arrived, opposite the island with swims free to our right for the others who were still on their way seemed like a good choice from a social perspective whilst providing a few features to cast to as well. There was an angler to our left who was catching well when I arrived. When he arrived, Richard, who had been here before, was right in this swim as soon as the angler vacated - he must have known it was a good peg and it was certainly a move that paid off for him as his 30 fish haul substantiates. It all kicked off at 8:30pm when, after we had all had fussy bites, Richard had the first screaming run. Whilst he was playing a decent cat to the net another of his reels started peeling off line in a desperate hurry. Shaun did the honours and landed this fish for him. They weighed 22lbs and 20lbs respectively. No sooner had Shaun landed the fish for Richard, his own rods started to produce good fish joined shortly after by Stuart catching his first cat. Not a catfish but a relief to catch something! For a while I was nicely distracted, running around weighing fish for people and taking lots of photos until it started to dawn on me that I was the only one who hadn't had a fish! Whilst I was vey happy for my mates I did get a bit down. It wasn't long after everybody kipped down for the night though that I had my first take - a 10lb common carp on double halibut pellet and a fruity popup! Right: Maybe this will produce next time? I was also fishing with 30mm bloodied eel pellets, which the others called 'donkey chokers' - these produced many bites but never resulted in a run, perhaps they were difficult to pick up? I tried to address this by adding a popup snowman style but within the hours I was there this was not a successful tactic. Each time a rig was cast out it was threaded onto a pva sock stuffed with halibut pellets and covered in glug. I changed over to 1oz leads on the recommendation of my mates who explained that catfish don't like any resistance and the venue insist on running rigs which further assists in minimising this. A few sleepless hours later came my second run. For a while I must admit I thought this fish was a carp as the fight was not dissimilar to my last fish. When It came to the net I was delighted to see a small catfish, a mere kitten in-fact, which tipped the scales to just 7lb. It wasn't long before I got to feel the real power that better size cat has to offer. This 13lber came at about 5am and felt like I had hooked a tractor! I was bowled over by the power of this fish compared to the last and had quite a job netting it by myself whilst the others were sleeping. At about 7am the others started waking up. I had still not had any sleep! Shaun landed a carp and a cat in close succession and then the heavens opened. It continued to pour and pour throughout the day until every thing I owned and every item of clothing I was wearing was absolutely sodden wet! The day continued in this fashion with no more fish for me until the early afternoon. As this was my first trip in pursuit of cats and each catch was bigger than the last it meant that every fish brought the joy of being my new PB. I get the impression with this lake that if you were there long enough and were catching you would connect with one of their real monsters eventually. On this occasion however, my PB settled on a respectable 17lb with which I am very happy, for now! My catch rate compared equally to Shaun and Stuart who caught the same number of fish as me, though they both caught slightly bigger. Richard on the other hand, who drew the 'golden peg' could do no wrong and lost count of how many he had had in the region of 30 fish, mostly upper doubles and low 20s! I don't doubt that this was good angling but I bet there wasn't one of us in the group who didn't secretly wish he could get in on that peg for a cast or two...! Left to right: Richard Mastin with 22lber, Shaun Haynes also with a 22lber and Stuart Groombridge with an 18lber. Charlie's Lake is definitely somewhere I intend on returning to. £30 for 24hrs is not unreasonable for the quality of the fishing. In the interest of objectivity my positivity for the place is countered by a nasty memory of a very disgusting toilet and I was concerned at the state of the mouths of the 3 carp that were caught between us. They have commendable rules regarding tackle, rigs etc which are all in the interest of fish safety but I wander how strictly these are enforced and no number of rules can grant certain customers a brain. On the whole however, this is a clean and comfortable fishery where the chance of a big cat is a likely prospect. Thanks to the guys who came on the social and made this such an enjoyable session. Please head over to the facebook group 'On the bank' if you're not already a member and I hope to see some of you at the next event!